I was cruising around the internet last week and happened across a picture of a watermelon dessert pizza. After seeing the picture, I couldn't help but give the great idea a try with some of our products. This recipe uses a light drizzle of our Pastamore Meyer Lemon Oil and a finishing garnish of Pastamore Fig Balsamic. Although you could make one of these watermelon pizzas with all sorts of fresh, tasty fruits. This will now be my go-to dessert for any summer time get together. The written recipe will make one pizza, but everything but the watermelon can be increased to make more servings. 1. Using a large knife, slice a 1" thick piece from the center of the watermelon. 2. Rinse apple and slice into thin slices. Cut in half length-wise. Stack the mint leaves together and cut as thinly as possible. 3. Evenly spread the salt and Pastamore Meyer Lemon Oil onto the watermelon. Cut into 6 even slices. 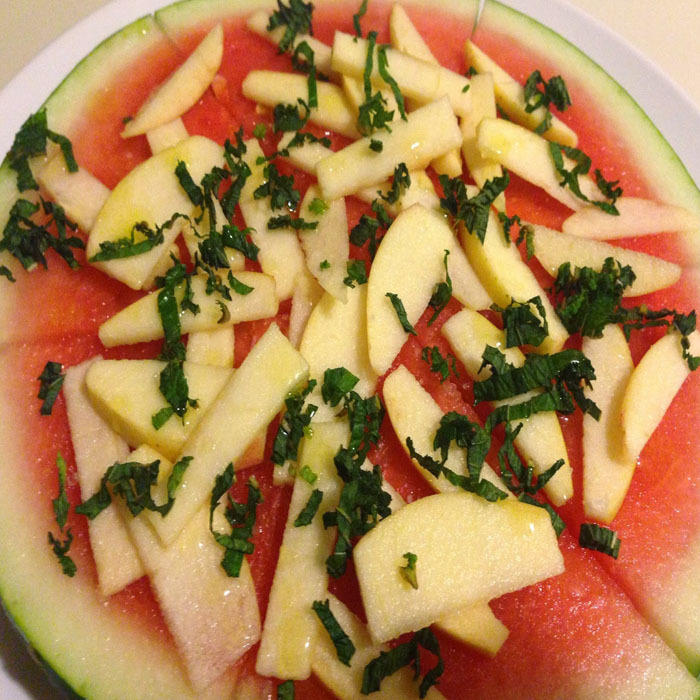 Spread the apples and mint evenly onto the watermelon. Either serve immediately or place into the refrigerator for up to one day. When served, garnish each slice with a drizzle of Pastamore Fig Balsamic Vinegar.